BHM magazine have a fantastic range of resources and events. The magazine is a great place to start when looking at Black History, with lots of articles and profiles detailing the achievements and contributions of Black British citizens. You can view previous issues (dating back to 2009), listings of events, purchase KS2 and KS3 resource packs and there is also access to some wonderful free resources too. 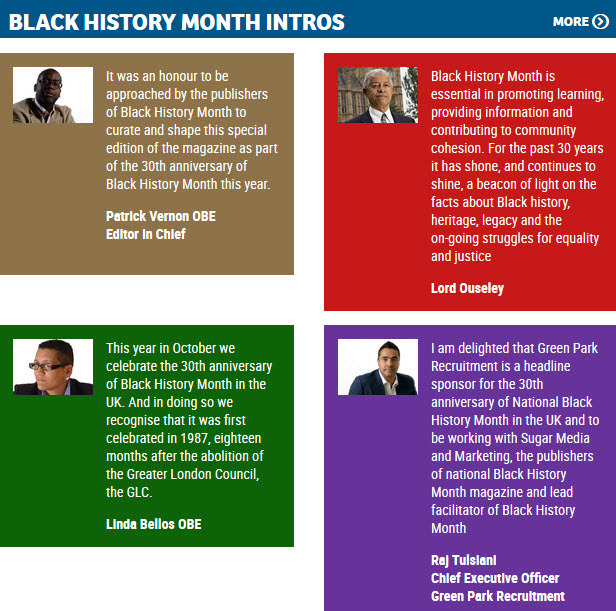 Black History Month website, created and maintained by Sugar Media and Marketing (publishers specialising in education, careers and the advancement of cultural diversity), already has lots of information about what's available for this year's Black History Month (BHM). Click here for links to events and activities in many London boroughs. For links to national listings, select the region from here. The following resources and guidance were produced for Black History Month 2016. Asians in Britain is a free learning resource aimed at students and the general public that has been produced in partnership with 'Beyond the Frame: Indian British Connections', a research project led by The Open University and funded by the Arts and Humanities Research Council. Bangla stories told by people who left Bengal after Independence in 1947 when the state was divided into West Bengal and East Pakistan (later Bangladesh). These are stories of people who left behind home and family, people who crossed new borders and travelled overseas, people who made new lives. Black British History The aim of Black British History at the Institute of Commonwealth Studies is to foster a creative dialogue between researchers, educationalists (mainstream and supplementary), archivists and curators, and policy makers. British Film Institute Screen Online- find out about Black Pioneers in film in this useful guide. It contains links to films, collectives, directors and British African stories and includes an impressive link to Black British film. British Library From the 'Learning' section of the British Library website, you can access both the 'Asians in Britain' (1858-1950) resources and the 'Campaign for Abolition' materials. These resources include timelines, images and links to other websites. Discovering Bristol Find out about Bristol’s role in the transatlantic slave trade. Who was involved, what was bought and sold, who stopped it, and what is the effect of the trade today? The Equiano Centre, UCL The Equiano Centre aims to foster the development of historical research into the black presence in Britain, to facilitate, via our public programmes of conference and workshops, exchange of ideas and information on the black presence in Britain and to become an internationally renowned research institute for the study of the black presence in Britain. Click the title link for more information and for access to resources. Forward to Freedom, the history of the British Anti-Apartheid Movement 1959-1994. Forward to Freedom tells the story of the British Anti-Apartheid Movement and its campaigns to support the people of South Africa in their fight against apartheid.thousands of people all over Britain took part in anti-apartheid activities. You can watch demonstrations and concerts, and hear from some of those involved.part of a wider education project set up by the AAM Archives Committee The AAM archive is held at the Bodleian Library, University of Oxford and is open to researchers on application for a Bodleian reader’s card. The archive of Wales AAM is at the National Library of Wales, Aberystwth and that of the Scottish AA Committee at Glasgow Caledonian University. History Lessons Project. The History Lessons Project, by the Runnymede Trust, attempts to deal with the question of 'who gets included in the story?'. You can access video content, a perspective paper and teaching resources from the project in addition to many other useful education resources. Jeffrey Green. Historian Jeffrey Green founded his website in 2009, in part a response to what he regarded as ill-founded articles on history and also to make available images and documents that he had been accumulating since the late 1970s. In late 2014, aware that contacts had information that had yet to be published in an on-line format, the site was opened to invited contributors and this facility still interests people. Jeffrey's website is a valuable resource for those looking into Black history- visit the website to find images, biographies and much, much more. Legacies of British Slave-ownership project is based at UCL and funded by the ESRC. Use this link to find resources, events and to check the database to find out more about slave ownership. Additionally, the 'Browse the legacies' section of the website and also the Blog are great sources of information about both the enslaved and the slave owners. Making Britain: This database was created to provide access to a wealth of material about the South Asian presence in Britain. It provides information about South Asians in Britain from 1870 to 1950 including information about organisational involvement, their British connections, and the major events. Making Histories website is an exciting collection of fascinating family histories and migration stories documented by young people in Cardiff, Leicester and Sheffield which has been created by the Runnymede Trust and the London School of Economics. You can hear incredible oral history interviews exploring journeys to Britain from parts of Europe, India, Africa, the Caribbean and beyond. Stories range from escaping a volcanic eruption in the Caribbean island of Montserrat to being recruited from Zambia to work in the NHS. These deeply personal stories will make you think about history in a completely new way. National Archives Take a virtual tour of areas connected to the Black and Asian Presence in London from 1500 to 1850, discover ancestory and find out little known facts about the earliest black and asian communities in the UK and the post war generation. The Black Presence website is part of the National Archives 'Exhibition' series, where many more BAME historical resources can be found. Northamptonshire Black History resources Northamptonshire Black History Association (NBHA) has produced a number of publications which include six titles under the Shaping The Future project and 2 books; the first book was developed with the local community (Sharing The Past) and the second with University of Northampton Black History students (Black British History: Selected Studies). Slave Registers of former British Colonial Dependencies, 1813-1834 In 1807 The Abolition of Slave Trade Act came into force. The act made the trade in slaves from Africa to the British colonies illegal. To combat illicit transportation following this act many of the British Colonies began keeping registers of black slaves who had been so-called “lawfully enslaved”. In 1819 the Office for the Registry of Colonial Slaves was established in London and copies of the slave registers kept by the colonies were sent to this office. Registration generally occurred once every three years. The registers continue through to 1834 when slavery was officially abolished. TREC (The Race Equality Centre) have created online downloads of the Black History series produced by the Guardian in 2008. Access the timelines here along with other downloadable material. Understanding and Celebrating Our Roots This project, by the Granby Somali Women’s Group, investigates the relationship between Britain and Somaliland during the period of colonisation and the impact the British had during this period. The project aims to capture stories about this period and and preserve them through oral traditions.